We ran the world's biggest survey on employee ideas and whether companies listen to them, and the results were pretty interesting. Household names including Google, Apple and 3M are held up as great examples of companies who recognize the power in listening to their employees. But how many companies truly practice this? We decided to find out. 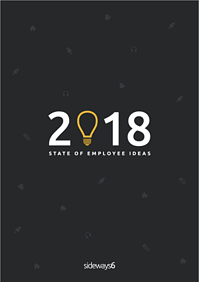 We launched the 'Ideas at Work' survey in the summer of 2018 to look at how businesses of all shapes and size treat employee ideas. It turns out people had a lot to say. We received responses from over 1,000 employees around the world, working in industries ranging from banking and construction to retail and healthcare, and there were some striking findings. The leadership team don’t engage with people at other levels of the organization to gain their insight and involve them. It seems that strong organizational hierarchies are in part to blame, with several millennial-aged respondents alluding to this factor in their responses. Our findings highlight the importance of valuing ideas equally wherever they come from. But valuing ideas also requires doing something with them! All too often, employees feel discouraged from sharing their ideas because they think they’ll never go anywhere. Over 50% of employees report that their company fails to implement good ideas. I feel my company pays lip service to ideas. Not enough action taken to implement good ideas. This execution gap can in part be explained by the way companies currently listen. The results show that less than a third of companies have a clear process in place for managing employee ideas. In light of this, it’s easy to see how good ideas sometimes get lost or forgotten by the wayside. Without a structured and transparent process for capturing employee ideas and tracking them through to implementation, their value often goes untapped. The reality is, ideas are meaningless without execution. Our research also revealed that over three-quarters of employees have a clear understanding of the challenges their company faces. Most companies, therefore, are arguably missing the opportunity to harness ideas from the very people who know the business best. My company doesn’t realize the knowledge and insight that lies within its employees. It would rather work with outside consultants. Who better to solve for the challenges faced by the company than the people on the front-lines, confronting those very challenges every day? You’d be surprised just what can happen when employers trust their workforce to come up with innovative ideas and solutions to problems. Just have a read of The Ultimate Guide to Employees Ideas for a sprinkling of great examples. To find out more, and to see how your industry stacks up when it comes to listening to employee ideas, download the full report here. Presenting results from the world's biggest ever survey on employee ideas and whether companies listen.